Members of the Judiciary Committee supported the measures after discussion that ranged from dissecting the language of the bills to amendments that would change the character of the bump stock bill entirely. The vote on the bump stock bill was 36 to 5. Bump stocks allow semiautomatic rifles to fire at a rate similar to that of machine guns and were used by the Las Vegas shooter who killed 58 people and injured hundreds more last October. The bill also would ban trigger cranks and other rate-of-fire enhancements. Ghost guns are weapons assembled from kits and parts ordered online that do not have serial numbers. Rep. Rob Sampson, R-Wolcott, opposed the bump stock legislation, saying it was “capitalizing on a recent very emotional situation” resulting from the mass shooting in Parkland, Fla., and that it was based on politics, not good policy. “I don’t see a purpose for bump stocks, but I also don’t see that we have the right to arbitrarily tell citizens of our state what they can or cannot own,” Sampson said. Sampson proposed three amendments to reframe the bill in ways he said would fight gun violence. One amendment would have recast the measure to do away with public financing for political campaigns and redirect the money to pay for public school resource officers and beds for people involuntarily committed to hospitals because of mental health problems. All the amendments were narrowly defeated. Rep. Robyn Porter, D-New Haven, backed the ban and said her support wasn’t based on an emotional response in the least. 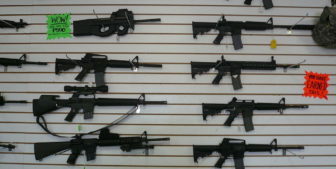 Other lawmakers said the bill’s language was too vague and not clear in its intent, and questioned the need for it since Connecticut already bans possession of fully automatic weapons. Rep. Doug Dubitsky, R-Chaplin, a staunch opponent of the measure banning ghost guns, called it completely unintelligible and criticized it repeatedly for ambiguity in detailing what would be considered illegal. Dubitsky said people in the state machine their own guns all the time and questioned if the bill would criminalize possession of items that could be fabricated into gun parts, such as a block of aluminum or pipes. Rep. Steve Stafstrom, D-Bridgeport, said it was remarkable that the lawmakers were debating the bump stock bill as an active shooter incident was happening at the YouTube headquarters in California. “The intent of this bill is fairly simple—to honor the intent of the gun laws this legislature passed exactly five years ago today, which says that automatic rifles have no place in our state and that when you take a semi-automatic rifle and add a bump stock to it you are skirting the laws and the intent of this state,” Stafstrom said. If enacted, the measure would mean anyone who violates its provisions could be charged with a class D felony after it takes effect on Oct. 1.